Ann M. Birr, age 87, of Kimball died on Tuesday, Feb. 21, 2017, at the Heritage House in Kimball with her children by her side. A memorial service will be held at 11 a.m. on Saturday, March 4, 2017 at the Cornerstone Church in Litchfield. Visitation will be one hour prior to the service at the church. Interment will be in the Lake Ripley Cemetery. Anabelle Mae Birr, the daughter of George and Elizabeth (Klinkner) Failes, was born on April 3, 1929, in Saint Cloud. She grew up in the Saint Cloud Area. On March 24, 1949, she was united in marriage to Alvin Birr in Mason City, Iowa. They moved to the twin cities where, together, they drove truck. They moved to Hutchinson in 1958. In the early sixties they bought a farm near Cosmos. They farmed there for a short time before moving back to the Hutchinson area. They moved to the Litchfield area and eventually in to Litchfield in 1971. She lived in Litchfield until she moved to Kimball in 2014. 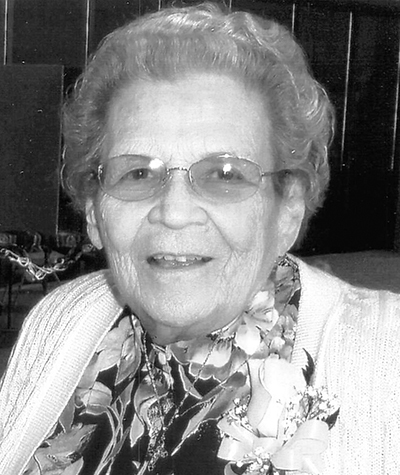 She will be remembered as a terrific cook who cooked for many local restaurants, senior dining and the Litchfield schools also cooking at Lake Geneva Bible Camp. Ann attended Cornerstone Church in Litchfield. Ann enjoyed painting and putting puzzles together. She also enjoyed gardening and kept a big flower and vegetable garden. She is survived by her children Arnie Birr of Howard Lake, Allen “Butch” (Susan Hanson) Birr of Elk River, Aaron (and Debbie) Birr of Eden Valley; grandchildren Melissa (and Josh) Gilbertson, Travis Birr, Shanon (and Tammy) Birr, Toby Birr, Brady (and Cathy) Birr, Marsha (and Brad) Hageman, Andy Birr (and fiancée Caitlynn); great-grandchildren Jack Gilbertson, Oliver Gilbertson, Beverly “Eve” Gilbertson, Jacob Birr, Gavin Birr, Logan Birr, Hali (Donnie) Maggert, Zach Birr, Alex Birr, Amber Loch, Rylan Barker, Addisyn Birr and great-great-granddaughter Anna Maggert. She was preceded in death by her parents, husband Alvin, brothers and sisters.